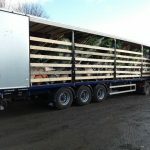 We grow pleached or espaliered trees in multiple sizes and varieties, we give them both names as they are very similar in their preparation. Pleached or espaliered trees can often be used to create instant screening around a garden, increasing the height of a fence or wall to give privacy from neighbours or a road or to block a view. Pleached trees are the natural way to bring an architectural look to a garden, without having to build genuine architectural features. These trees have clear stems, usually up to 1.8m tall (6ft) and this allows enough space beneath their canopies for generous planting and seating. Some of our favourite species for pleaching are Quercus ilex, Carpinus betulus and Photinia Red Robin. The head size is usually 1.8m (6ft) wide and 1.2m (4ft) tall and so can be planted in a row at 2metre spacings. There are higher options for the heads to give higher privacy or screening but these do tend to have a narrower spread and so you need more to cover the distance. In terms of architectural planting these really do create a very impactive design and although the evergreen options are still our most popular, some of the deciduous options with their change in colour with the seasons are stunning if you can afford to lose some of the cover in the wintertime. The Hornbeam and beech are great options here as they do hold on to some of their autumnal copper leaves throughout the winter giving you some foliage cover and because they are deciduous they come in slightly cheaper than their evergreen counterparts. These trees come in a range of varieties and colours like the Eleagnus Ebbengei with its silver evergreen foliage or the Ligustrum Japonicum Aureum with its golden yellow colouring. I love the Holly options for their evergreen cover and beautiful red berries the options are endless and we have a good selection on the site but have other options too, just ask if you don’t see what you are looking for. Low screens may be an option that might suit your garden better, these are very similar but have no clear stem but a screen of foliage from ground level and an be anything from 150 -120cm tall (5-6ft) up to 350cm (11.5ft) tall. 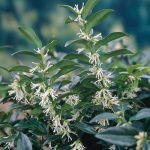 There are a few extra options available grown on this way including some flowering options like the evergreen Jasmine with its scented white flowers and the wisteria with its stunning lilac blue flowers as well as all the other option. Please feel free to contact us if you have any questions. Due to our years of experience we can propose solutions that perhaps hadn’t crossed your mind yet.